In part I of this series, I focused my attention on a transaction (hopefully the only one) between the National World War II Museum and Bands for Arms, discussing the handling of artifacts that had been donated to the museum by individuals. Part I is the catalyst for this series, but today’s could stand on it’s own. With that ordeal between those two entities and the militaria collector community, it is debatable as to whether the collectors are actually happy with the results. While the artifacts in question were decided (by the museum staffer) to not have been World War II pieces, that doesn’t equate to them not being historically significant or valuable to militaria collectors. This G-1 flight jacket belonged to Fred Losch (Capt. USMC), aviator of the famed VMF-214 (Blacksheep Squadron) is housed at the Museum of Flight in Seattle. In other areas of collecting, destroying an historic artifact for the sum of it’s parts is nothing new. Even within the area of military collecting it is still practiced — stripping uniforms of decorations, patches, buttons, etc. — yet it is frowned upon by purists. 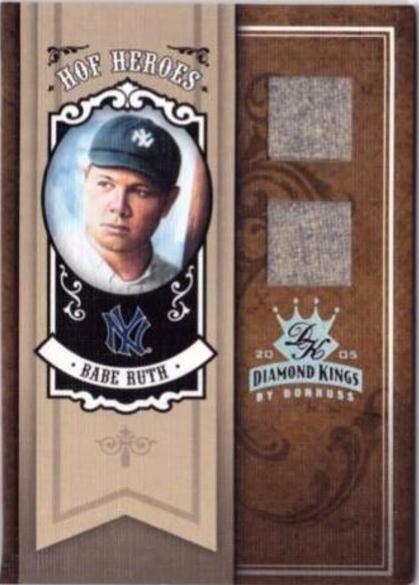 To make this limited edition insert card, Donruss destroyed one full set of Babe Ruth’s road gray uniforms. Being a huge fan of major and minor league baseball, I dabbled in this arena of collecting, including baseball cards. My financial resources were limited so I had to collect within my means, focusing on certain aspects rather than any and all cards. I recall some card manufacturers in the 1990s launched into a practice of adding “insert” or special cards that were limited in production into their card sets making them rare and highly desirable among collectors. As the fervor increased with each new series or product line, so did the drive to make the insert cards more significant and create increased demand. This translated into significant revenue generation for the card companies. I started to get disenchanted with sports cards at the point where they began destroying pieces of history for profit. Several card companies were acquiring rare artifacts (specifically, bats and uniforms) that were attributed to legendary ball players, cutting them into ¾-inch square pieces and mounting these into special insert cards. Imagine shredding a game-worn Babe Ruth jersey such as a 1920 Yankees road uniform top – which ultimately sold for $4,4m – into a few hundred little pieces. It has been done… several times. 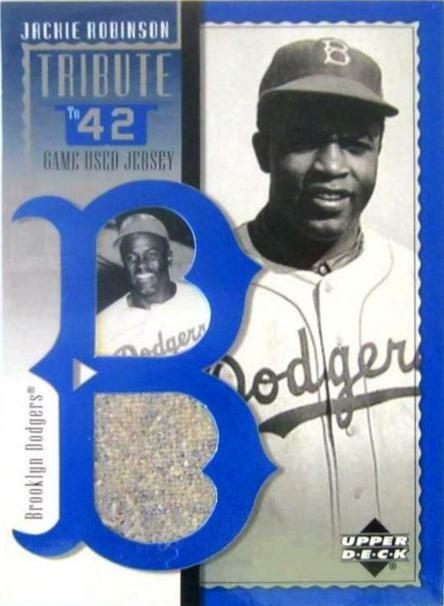 Upper Deck carved up a road jersey worn by Hall of Fame player, Jackie Robinson. Baseball players do wear a number of uniforms throughout a season – multiples of both home and road. Considering the typically lengthy Hall-of-Fame careers, these stars will don a considerable number of uniforms. For combat veterans who only served during a conflict, their uniform count will be significantly less. Veterans of World War II often returned with just the dress uniform they were wearing. When the war was over, these veterans either disposed of their military garb or stowed it away in the closet or attic. To reiterate, militaria collectors do not take issue with veterans’ (or their families) decisions to donate their own uniforms to companies like Bands for Arms. What is difficult to contend with is the loss of the military heritage and connection to individual history through these uniforms. Would anyone imagine doing the same thing with a uniform from Medal of Honor recipient Sergeant John Basilone? 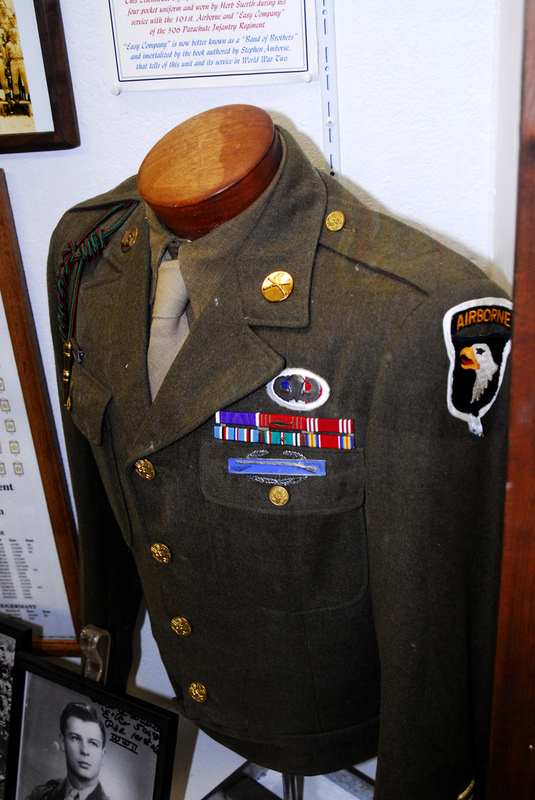 Private Herb Suerth (of “E” Company, 506 PIR, 101st A/B) “Ike” jacket on display at the Indiana Military Museum. Would the band buyers rush to purchase a bracelet made from Major Richard Winters (of “Band of Brothers” fame) uniform? I’d imagine that bracelets made from these high-profile veterans would necessitate a boosted sale price, which would lead to a considerable amount of funds for the museum’s upkeep. But at what cost? Advance to part III of this series! Posted on February 18, 2016, in Baseball, General Militaria Collecting, Sports Militaria. Bookmark the permalink. Leave a comment.